A sinkhole that formed in January behind Bertha’s cutting face led independent experts to emphasize stricter protocols before contractors continue the Highway 99 tunnel dig under Seattle’s Alaskan Way Viaduct. Soon after the new year’s restart of tunnel-machine Bertha, geotechnical expert Gregg Korbin became alarmed when he read a daily performance report. The numbers told him the giant drill was eating dirt too fast. Korbin’s intuition about the soil was spot on. A sinkhole opened up the next day above the future Highway 99 tunnel route, about 110 feet behind the boring machine’s rotary cutting face. Contractors at Seattle Tunnel Partners (STP) immediately filled it with 250 yards of concrete-soil mixture. When the news reached the team, Korbin turned to sarcasm, and a warning. Sinkholes are a common risk in tunnel construction and especially worrisome on this project, because the 57-foot-diameter tunnel will run close to downtown buildings and the Alaskan Way Viaduct, which the tunnel is set to replace, perhaps by spring 2018. The messages, released to The Seattle Times under public-records requests, show the level of worry from the Washington State Department of Transportation and its consulting engineers that led to Gov. Jay Inslee’s announcement Jan. 14 that STP must stop drilling until contractors submitted an analysis of the sinkhole incident and a plan to improve operations. 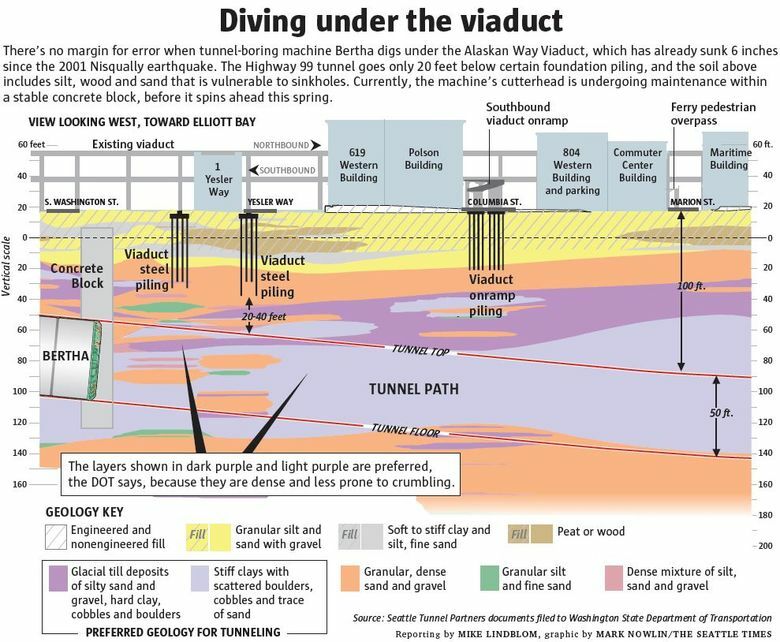 Records also show how the incident has heightened the vigilance — you could even say paranoia — among state officials and contractors, as Bertha prepares for a spring dive under the fragile Alaskan Way Viaduct. For instance, tubes have been installed in the dirt near Yesler Way so that if the viaduct lists, subcontractors could immediately inject grout to reinforce the shallow foundations. You’ve seen the concept illustrated in TV ads for Slabjack or Robbins, which offer to stabilize your house or driveway by pumping concrete into just the right spot. STP project manager Chris Dixon has called the six-week suspension “wrongful and unjustified.” He has said crews were more focused on Bertha’s performance during the restart than on constant soil monitoring. The disclosed records support certain arguments Dixon has made in rebuttals to the state. Public safety was never at risk, STP analyses say, because a cordon of concrete piling installed by STP protected the viaduct in what was known to be an area of unstable soil, and to some extent, a testing zone. In addition, before the sinkhole was discovered, contractors notified the state and held a joint meeting to discuss an unusual situation in which buried gauges called extensometers sank. The tunnel machine was spinning comfortably at 1 rpm, keeping its cool and not straining. The dig continued. A state consultant’s reply to Korbin said the team had not observed any overexcavation, but lesser problems may have caused the gauges to drop. “Lower anchors on two extensometers have dropped beyond their range. STP was responsive to the concern. They conducted a response level meeting and made some changes to gap injection and that appears to have improved things,” wrote Rick Conte of Parsons Brinckerhoff, the engineering firm managing the project for WSDOT. After the 250 cubic-yard sinkhole, another member of the expert team, Toby Wightman, sent an email to colleagues predicting the void would expand, which it did. STP filled those gaps. In February, Dixon filed a more-intensive monitoring plan, prompting the state to lift its suspension order. Bertha resumed digging Feb. 23. The machine traveled another 300 feet by March 12, stopping at an inspection site, for a total 1,560 feet to date, in the 9,270-foot route from Sodo to South Lake Union. 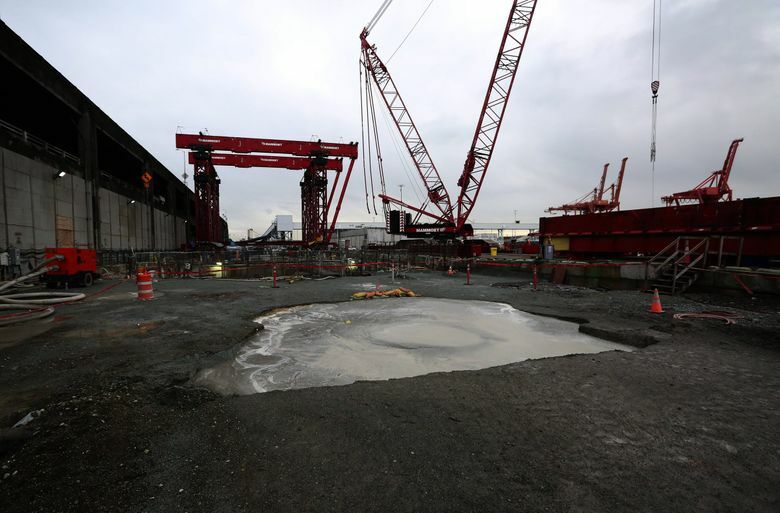 A war of words over the sinkhole and a barge that spilled soil into Elliott Bay may affect lawsuits about cost overruns. WSDOT asserted four days later, in a letter from Brian Nielsen, a deputy administrator, the sinkhole illustrated “a lack of accountability and care” by leaders of the contracting team. Documents show that a recurring source of frustration, for both the independent and WSDOT engineers, involves whether contractors are able to keep the dirt firm enough to prevent sinkholes. Tunnelers are supposed to keep a firm plug of dirt inside the conveyor screw, behind the cutterhead, that would assure a consistent pace of soil movement and pressure. STP has sometimes closed gates within the conveyor system to help keep the cutter area filled with dirt, as a balance against more dirt rapidly flowing in. Team member Daniele Peila, a professor from Italy, was in Seattle the week of the sinkhole, and raised questions in a report about the muck being too fluid. In its restart plan, STP included rules for using the gates only “as a last resort” — and that appears to have satisfied the expert team, after the state rejected STP’s first response in late January. STP’s new Tunnel Monitoring Action Plan specifies how much the viaduct may tilt before work would be reviewed or stopped. Any twisting motion, or “differential settlement,” is especially hazardous because it can crack the girders or beam-to-column connections. Alert levels are a 0.75-inch differential settlement between the viaduct’s waterfront and inland sides; or 0.35 inch lengthwise from the north to the south end of a span; or 1.5 inches of overall settlement. At those limits, a task force would develop a response with 24 hours. • Intensive grouting is planned to avert sinkholes and settlement. That includes pre-emptive grouting when contractors suspect too much soil is being removed, even if actual gaps aren’t manifest. Grouting crews will be on call in case of an emergency. They can inject grout even after Bertha has passed through — avoiding the sort of delayed sinkhole that formed Jan. 12. This week, contractors continue their fourth week of machine inspections and in some cases are replacing cutter parts at the drill’s front end, said Laura Newborn, WSDOT spokeswoman. The task moves slowly. So far there have been more than 88 shifts, of one to two hours each, by divers under hyperbaric pressure at the front of the machine, Newborn said. When the machine passes underneath the viaduct, the state will close it to traffic for about two weeks as a precaution. The exact date has not been announced.